The future of work is flexible. In order to embrace people from all works of life and backgrounds, we must embrace what technology has enabled -- as long as people have a good Internet connection, they can work from anywhere. This WITty episode will include a discussion on the benefits of allowing your team to work from anywhere (including better work-life balance, more diverse team, often lower costs), how to make a distributed or remote team flourish, how to flourish yourself working from home, the growing trend of project-based and freelance work, and the opportunities to feel connected with a community no matter where you work. - Leanne Creasey, who previously launched and ran two of London's most popular coworking spaces, works as a startup coach for new entrepreneurs and is currently working with Cuckooz, who offers design-led serviced apartments alongside Cuckooz Nest, London's first coworking space and pay-as-you-go nursery for under twos. - Emma MacGregor heads up the platform success team at YunoJuno whose core beliefs is to find freedom in freelancing. YunoJuno offers a platform which enables those in creative and tech freelancers to link up for work with London and New York-based agencies. - Sophie Segal, who founded the Mindset Shift Summit a remote conference for women, alongside developing a portfolio career and running a business in sales and marketing, being a mum of two, and being involved in the flexible working space. - Lisette Sutherland is the director of Collaboration Superpowers, a company that helps people work together from anywhere through online and in-person workshops. She also produces a weekly podcast featuring interviews with remote working experts highlighting the challenges and successes of working with virtual teams. We will have a rousing discussion of the future of fintech from women already driving that future. We will discuss hot topics (of course over tea) such as the payments industry, cryptocurrency, fintech jobs and more! - What are the lessons learned as we enter the next age of Fintech? - Do you need to ‘get’ tech to work in technology? - What are some of the mistakes to avoid? - What commercial models make sense? - What challenges are the payments industry currently seeing? - How do marketplace payments differ from standard e-commerce payments? - Can payments do more than is currently possible? - What's new in fintech marketing? ...and of course YOUR live audience questions first and foremost! Maya Middlemiss, the managing director of BlockSparks OÜ, and specializes in effective marketing communications for the blockchain and fintech space. Effective storytelling has never been more critical, in this complex and fragmented world, and helping brands and consumers connect and understand each other is her passion. Anna Tsyupko, one of Wired's Power Payments 10 and CEO and co-founder of Paybase. She has a passion for payments and the opportunities that eMoney infrastructure can offer businesses that require more than a simple payment gateway. Her goal is to ensure all businesses have the freedom to build what they want to build by offering a truly flexible payment solution. Susie West, founder & CEO of sharedserviceslink, a community for shared services leaders, offering thought leadership for those driving the future of the financial market. She lives in New York and London, and works with her team to cover their global market. What is personal branding? What you are projecting to the world online and off -- and what people are saying about you. How do you maintain your authentic self and be someone easily found and regarded as a (very hire-able) thought leader in your field? That's what today's conversation is about, talking to five women who have built their own businesses (and brands!) around some aspect of personal branding and personal growth. Who should attend? This is a no-brainer for anyone really because we are all looking to improve how our work is perceived and how we can convert that perception into more work and better networking. And all of these amazing women on growing a business, building a niche, and promoting yourself as a brand, online and off! 80% of developers don’t feel it’s their responsibility if unethical products go live. Are they right? This episode of WIT: Women in Touch features a conversation among women in tech who believe this majority is not right. As a follow up to July's Coed: Ethics conference, a London tech ethics conference, we're grabbing a cuppa with women who are actively working on the ethics surrounding data science, decision making, scaling, coding, the psychology and motivation behind it all. Who should join? While our guests are awesome women in tech, the cases of Facebook, Uber and Volkswagen are not just isolated incidents and everyone at any level at any company faces ethical decisions every day. We think everyone can benefit from joining this discussion live or listening to the recording after! Applying a framework or an action plan to consider the ethical implications of your work is a business best practice. How can we move from writing oaths and manifestos to best practices? Yanqing Cheng - high-scale networking systems engineer with MetaSwitch Networks - a job mixing forward-looking ideas with decades-old protocols, which provides constant insights into the balancing act between innovation and stability. She is fascinated by machine learning and future tech, and its impact on ethical decision making. Anne Currie - part of the tech industry for nearly 25 years working on giant C servers and distributed systems in the 90s, eCommerce services in the noughts and DevOps and infrastructure in this decade. She is interested in the evolution of the tech industry, and of the devs who work in it. Founder of the Coed Ethics tech ethics conference. Emma Prest - sits on the Editorial Advisory Committee of the Bureau of Investigative Journalism and on the board of Sum of Us. She was previously a program coordinator at Tactical Tech, providing hands-on help for activists using data in campaigning. She's now the executive director at DataKind UK. What are you doing to make sure your office is diverse and welcoming? Diversity in the work environment is proven to promote acceptance, respect, and teamwork, embracing differences in race, age, gender, native language, political beliefs, religion, sexual orientation, and communication styles among employees. Movements like #metoo has us talking about this more in certain industries and at a systemic level, but what can we do as individuals in the workplace? Grab your drink and sit down to join us for what's sure to be an engaging episode of WIT: Women in Touch, when women trying to make a change are going to share their advice for how you can too, whether you are in a position to attract and hire talent or you are struggling to overcome these barriers. And, once diversity is increased at your office or university, what can you do to make it work? April 10 marks Equal Pay Day for women in the US (the infamous 78 cents on the dollar), but we are choosing to hold our discussion on diversity and pay gaps on August 8, following Equal Pay Day for black women in the US. Women in tech make on average $40,000 less a year than their male counterparts. Women of color in tech in particular often lack the support channels and feel ostracized in their roles. This discussion is in part a follow-up to our first episode which focused on the Working Mom. Mothers end up earning about 40% less than what their childless female counterparts earn over a lifetime. The pay gap between white women and black women is the fastest growing income inequality there is, according to a report by the Economic Policy Institute. This gap has grown from 6% in 1979 to 19% today, and it's growing directly alongside greater inequality. The main reason to join is this isn't just an esoteric conversation, but a practical one that gives everyone practical ways to make a change, no matter what her or his role is. The Wellness Industry is set to be the next trillion-dollar industry. Yet it remains a rare sector that isn’t just dominated by corporations, but is filled with solo practitioners, freelancers, and small businesses. Interested in following your passion in the wellness space? Want to learn how to take a creative idea and turn it into a successful business? Well grab yourself a cuppa and join this conversation on the business side of wellness. - Melody Coleman - Personal Trainer and Online Coach helping professionals to improve their health alongside their strength and fitness reflecting their values and life goals. - Yuri Tada - Yoga instructor for Pregnancy Yoga, Postnatal Yoga with Babies, general yoga, corporate yoga, small group yoga, private yoga, Food, beverage, health & wellness. Event runner. - Jimena Tascon - Family Health & Corporate Wellness - Yoga Teacher focused on improving women’s health, kids wellness and mindfulness for professionals. Steering people’s habits towards finding their own ‘life balance’. Whether you're a life coach, a yoga instructor, a nutrition expert or a different kind of solopreneur, you could benefit from engaging with our discussion! During this conversation, we'll talk about the path that led these ladies to wellness small businesses, how to be a generalist versus specialized in a wellness niche, how to build partnerships to grow your business, wellness marketing, and how to more than just make ends meet. Meet our Agile Mavens: Andrea Carbert manages complex, regulated healthcare projects in an agile way; Andrea Darabos is an agile coach at HSBC as well as a leadership coach; Deborah Preus is a certified life coach, helping change leaders find more join and impact through phone coaching; Portia Tung is an executive and personal Coach, agile coach and play researcher; Nikoletta Tatár is a Certified Scrum Professional, agile coach and Scrum Master; and Marjan Venema is a coach, an agile advocate, storyteller, developer and designer. Who should join? Anyone interested in making a career in coaching or anyone who is involved in a company considering or going through an agile transformation. Questions welcome! We all want to say “I love my job!” but it’s not a magic wish. Job satisfaction is something you have to design into your daily life, from your work choices to your profile to your networks. This episode we sit down for a cup and conversation with Mia Sherman from the popular Escape the City (https://www.escapethecity.org/) job transformation coaching in London and New York, and two women who have successfully redesigned happiness at work. This episode we'll learn the stories and ask questions of two fabulous female entrepreneurs: Vix Anderton, talking about her journey from an Royal Air Force intelligence officer to building a portfolio career and her own company The Practical Balance (thepracticalbalance.com), a platform to promote the wellbeing and mental health of founders; and Luzana Costa, talking about her purposeful pivot from the oil and gas industry to working with a couple of social enterprises in Angola and a crowdfunding company for social enterprises here in London, and working full time with tech startups -- plus check out her inspiring blog: A Woman about the World (https://medium.com/woman-about-the-world) Both women are heavily dedicated to empowering diversity. Get ready to ask your own questions and learn from those that have been there, done that in designing careers they truly love! 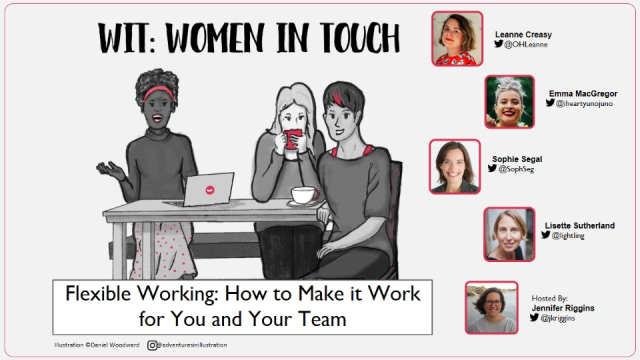 Women and men alike are welcome to listen in (live or sign up now for link to recording later) to learn and ask our WIT women at work experts for advice! This conversation features women in tech who have benefited from receiving and giving mentoring, but it's really for anyone who is looking for a hand up or to offer one. Our experts will share their experiences and talk about the importance of mentoring — though that it's not for everyone — how to find the right mentor and mentee for you, and how it's an important part of building a career in tech. So grab your cuppa and join the conversation for the second episode of WIT: Women in Tech! We are talking to four awesome women in tech -- Tammy Bütow, SRE (site reliability engineering) and chaos engineering specialist at Gremlin; Ana Medina, chaos engineer at Gremlin (formerly Uber); Charu Sharma, CEO of Next Play an AI tool that helps companies connect their employees internally for mentoring; Etel Sverdlov, director of developer community and first hire at Digital Ocean; and Prima Virani, senior security engineer at Marqueta. Their roles in tech benefit from a wealth of experience working with and securing those systems. But you usually have to have already worked with those systems to then be able to get jobs working with those systems -- a struggle for any junior-level job, but a particularly strong one in the tech space. This is where mentoring comes in. Each of these awesome women has benefited from being mentored and benefit from giving back and mentoring. Join us (or sign up to listen to the recording later) to learn the best way to find a mentor or mentee/mentoree and how to leverage that relationship so you're both getting the most out of it. You'll learn about informal and formal guilds that support that mentoring, and what companies should do to facilitate these benefits. And you'll hear personal stories from these women who have built solid careers in tech on the shoulders of experience and support. Being a working mom is the new norm but that doesn’t make it any easier. This week’s cuppa talks to four working moms — in non-profit, healthcare, business, and entertainment — who have juggled contracted and self-employed roles, motherhood, and breastfeeding. Our awesome guests to kick off this series of conversations with awesome women of influence will be author of 'The Big Letdown', communications strategist and social commentator Kimberly Seals Allers; actress and musician Noa Bodner; self-employed occupational therapist Melinda Eriksen; and nonprofit marketing director Kate McLoughlin Thornton. - and of course your questions during the live taping! NOTE: This week is just as important for non-parents to join. We all work alongside working moms and they are essential to the future of every sector — including humanity! Join the live show to get the answers to all the questions you were afraid to ask or catch up by signing up now and get the recording sent to you afterwards. Wit and experience from women on the ground.